President Charles de Gaulle asked how could people expect him to run a country with 246 kinds of cheese. Judged by this metric, Portugal is easier to govern than France. We have fewer cheese varieties. But there are still many regions, types of milk, producers, and styles. Many interesting Portuguese cheeses are hard to find. They are made in small quantities by artisanal producers and sold in local markets. 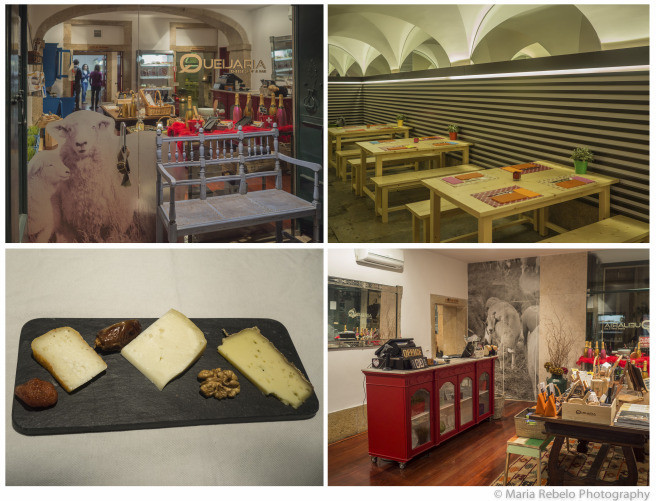 Queijaria, a new store in Lisbon, makes it easy to sample these local specialties. The store is run by people who are passionate about cheese and wine, so they are uniquely qualified to serve as your guide. They prepare a degustacion of different cheeses, perfectly sequenced and paired with great wines. In one sitting, your palate can travel from North to South, to the island of Azores and back to continental Portugal. It’s a gastronomical journey you will not forget! I love cheese, of all kinds. Although I don’t know that I’ve tasted any cheese from beyond these shores, I would certainly love the opportunity. And Portugal seems like a great place to start. Thank you, Mr. Spencer. Maybe some day we four can visit Portugal followed by Bavaria. Until then we can dream. Of course The Lovely Charlotte was then quick to point out that there was, at this very moment, a nice chunk of imported Scandinavian Farmer’s Cheese in the refrigerator of which I had partaken on many an occasion. So, as with most of my rather useless uttering, you may render my previous comment of no account and of little report. Some cheeses can be scary…if they’re very strong, see. I’ve had a lot of Italian cheeses that are strong. I likes them almost all of them. Love cheeses. The girls say that some of them taste like the bottom of someones shoes….they tend to be the strong tasting ones. Thanks for sharing. I like cheese, too. Thank you for stopping by and posting!